Quess East Bengal defeated Neroca FC 2-0 in their opening match of the I-League at the Khuman Lampak Stadium. Enrique Esqueda scored a double on his league debut for the Red and Golds at the Kolkata giants earned a crucial win right off the bat against last season’s runners-up. 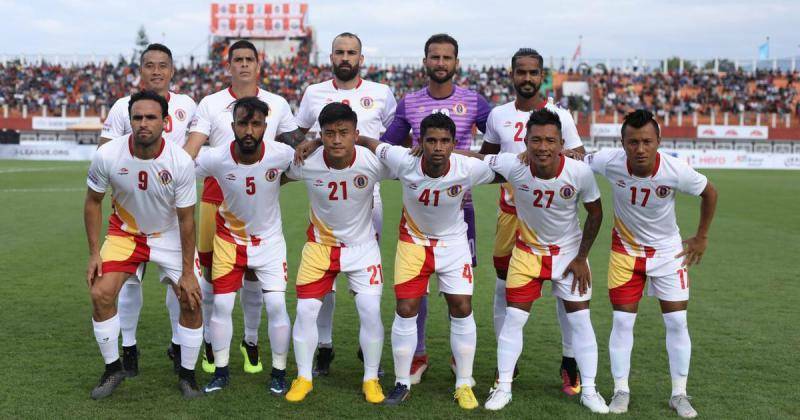 Costa Rican World cupper Jhonny Acosta also made his debut for East Bengal, while Katsumi Yusa and Eduardo Ferreira featured for Neroca against their former side. Left-back Manoj Mohammed’s throw-in was met by Neroca captain Aryn Williams but his backward header fell to Esqueda, who gave the visitors an early lead. At the other end, Malemnganba Meitei had the goal at his mercy after a feeble punch by Rakshit Dagar but he could not get his team the equaliser after Manoj cleared the ball off the line. Katsumi Yusa was stretchered off at half-time as East Bengal were forced into an early substitution. After the break, Denechandram Meitei fouled Laldanmawia Ralte in the box and Esqueda stepped up to take the penalty and dispatch it home. The goalscorer also ensured that his team kept a clean sheet by clearing Ferreira’s header off the line. Neroca faces Gokulam Kerala at home next while East Bengal travels to Shillong to face Lajong in their next away game. In front of a noisy 28,400 strong home crowd, Gokulam Kerala FC returned with honours in their opening I-League fixture against Mohun Bagan at the Kozhikode’s EMS Corporation stadium on Saturday. Lalchhawnkima’s own goal in the second half cancelled out Ugandan striker Henry Kisekka’s header for Bagan in the 41st minute. Bino George’s Gokulam Kerala FC began the match with Ghanaian Daniel Addo leading the back four and the talented Arjun Jayaraj, Brazilian Felipe Castro and Ugandan Mudde Musa part of a three-man midfield. The forward line was led by Grenadian international Antonio German. Shibinraj started in the Gokulam goal. Mohun Bagan coach Sankarlal Chakraborty went in with the Cameroonian-Ugandan pair of Dipanda Dicka and Henry Kisekka upfront with Egyptian Omar El Hussieny playing in the hole behind them. Youngster Pintu Mahata and Kerala’s PM Britto were to make the runs from the wings with another youngster Sourav Das in centre of midfield. The back line was led by Nigerian Eze Kingsley with the talented Arijit Bagui alongside. Lalramchulova as right back and Abhishek Ambekar as left back also returned good efforts. Sankar Roy was preferred in the Bagan goal. Although Gokulam began with a flurry of attacks with Mudde Mussa creating an opening early Bagan were the stronger outfit in the first quarter of an hour with the first attempt coming from Egyptian Husseiney and Ugandan Kisekka. Hussieny latched on to a loose ball outside the Gokulam box and glided inside for his right-footed toe-poke to beat Shibinraj and ricocheted off the near post even as Kisekka let loose a long ranger from a favourable position sail over. In the 18th minute, Pintu Mahata, who had a good first half in the left-wing, missed a sitter from Dicka’s wonderful ball inside the box. His awkward connection with his left-foot with the goalkeeper and an empty net at his mercy denied Bagan a deserving lead. The selfless Dicka then found Kisekka with a delectable lob over the Gokulam defence and the Ugandan’s lob in return, went over Shibinraj’s reach and was cleared from the goal-line by a tireless Abhishek Das in the Gokulam defence. 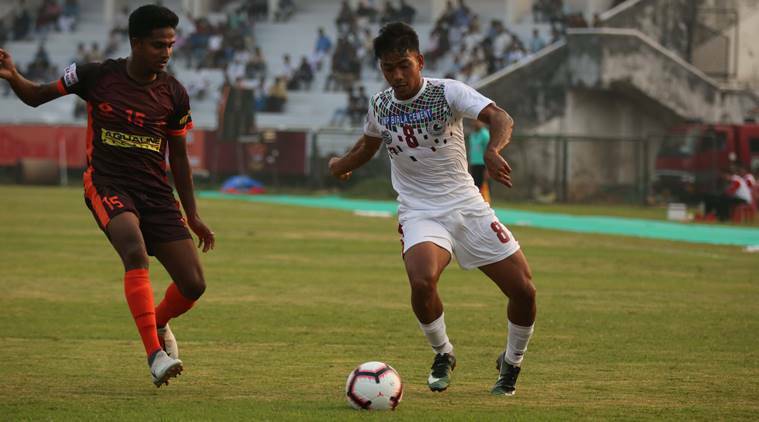 Bagan eventually, took the lead in the 41st minute, when Arijit Bagui floated a free-kick inside the box, which met with Kisekka perfectly and his angled-header beat Shibinraj at the far post to hand the away side the lead. Then there was a drama at both ends in the 42nd minute. First, Dipanda Dicka unleashed a run inside the box taking out two defenders and his well-placed shot brought about a great save from Shibinraj but landed at the feet of an onrushing Kisekka who failed to control his effort. Then English born Antonio German, on the counter, found himself one to one with the goalkeeper, but with the pressure from an onrushing defender, he shot straight from just outside the box, into the diving clutches of Roy. Gokulam began the second half with a sense of urgency and in particular, the introduction of Rajesh in place of under-22 Gani Nigam, saw the hosts turn the possession and dominance tables completely. Gokulam were eventually rewarded for their enterprise when a comedy of errors inside the box earned them the equaliser. Roy’s weak punch to clear a cross found Arjun Jayaraj heading towards goal. In the process, Kinsley cleared it but it struck Kim Kima on the rebound and went in to send the home crowd into delirium. Rajesh then had two gilt-edged chances. First, in the 73rd minute when his powerful curling shot from the top of the box was tipped over by Roy to come off the bar and then again when his shot from close was saved by the Bagan goalie, who otherwise had a good day in office. Mohun Bagan’s only clear chance of the half came in injury time when Dicka’s header in the 92nd minute went wide. Coach Shankarlal rang in the changes and brought in William Lalnunfella, veteran Mehtab Hussain and even rested Henry Kisekka in the end for the last throw of the dice with Azharuddin Mallick, but to no avail. Defending champions Minerva Punjab FC begin their title defence in the I-League with a home game against Goan giants Churchill Brothers here Sunday. The ‘Warriors’ from Punjab have a 2-1 head-to-head advantage going into the game with the former two-time winners. Both teams have new strategists at the helm in the form of Irishman Paul Munster for the champions and Romanian Petre Gigiu for the Goans and with new look squads from last year, it will be interesting to see what impressions they form at the beginning of the season.